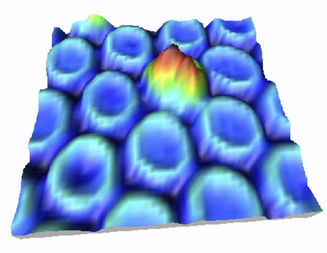 Three-dimensional view of the nanomesh [h-BN/Rh(111)] with one trapped Cu-phthalocyanine molecule (C32H16CuN8) at room temperature. The mesh is synthetised at 1000 K and stable in air and liquids. Take a look at our research results!